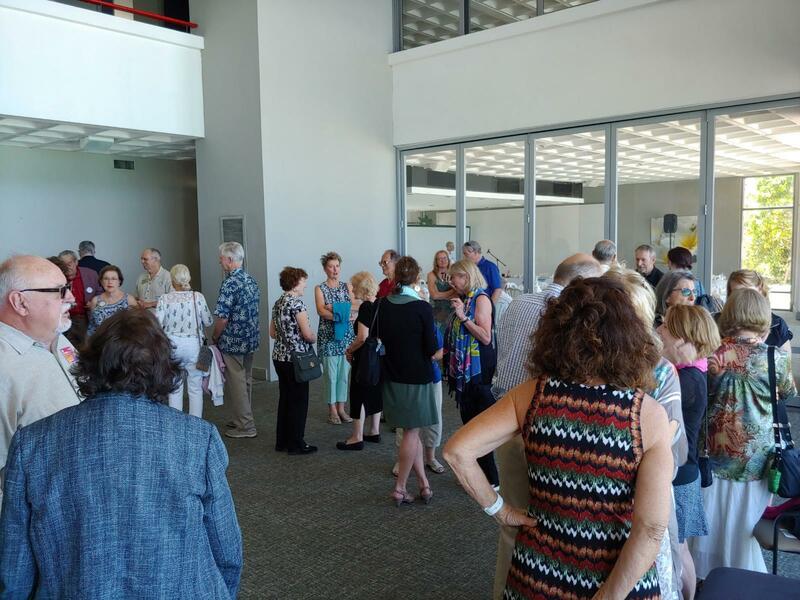 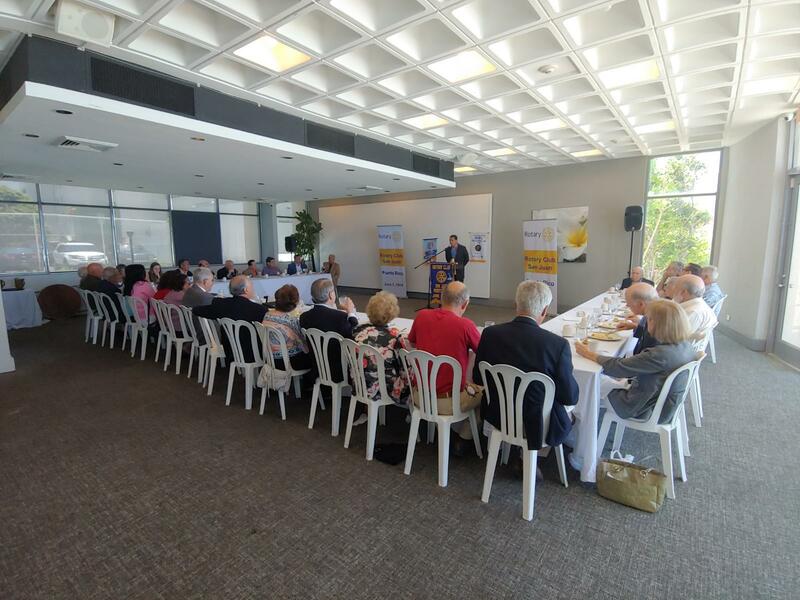 A new seating arrangement was used last week to focus more attention on invited guest speakers and to create a more communal meeting among our members and guests. 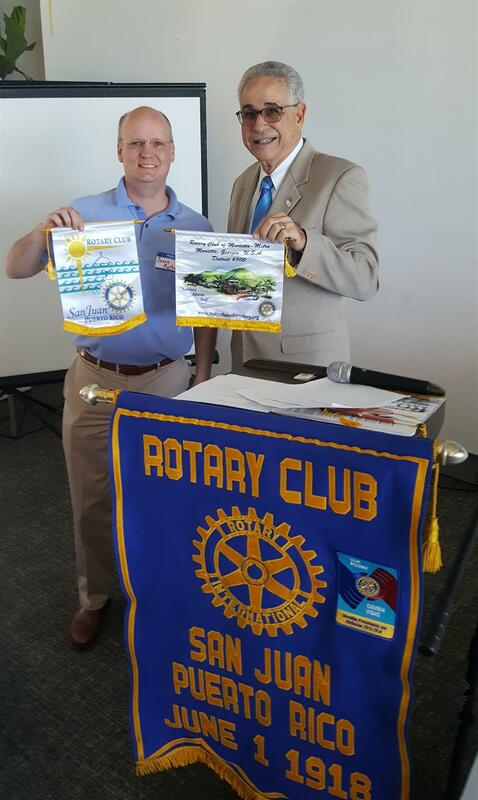 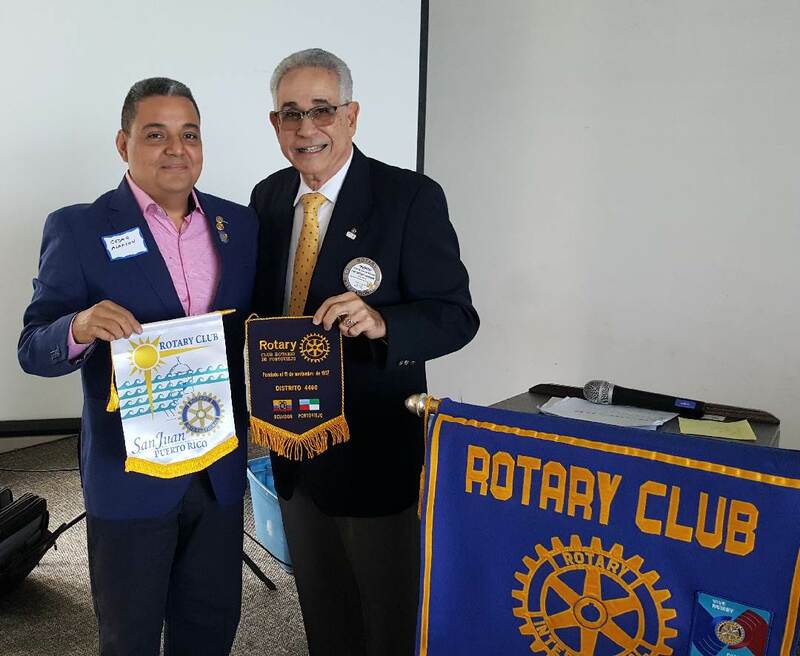 CESAR ALARCON ZAMBRANO, Visiting Rotarian, and Secretary of his club, from Porto Viejo, Ecuador, exchanged banners with President Pepito. 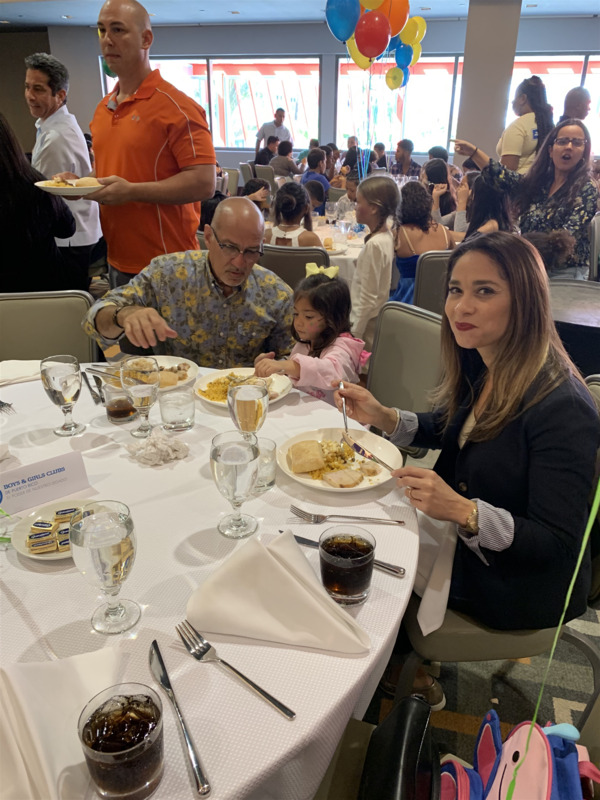 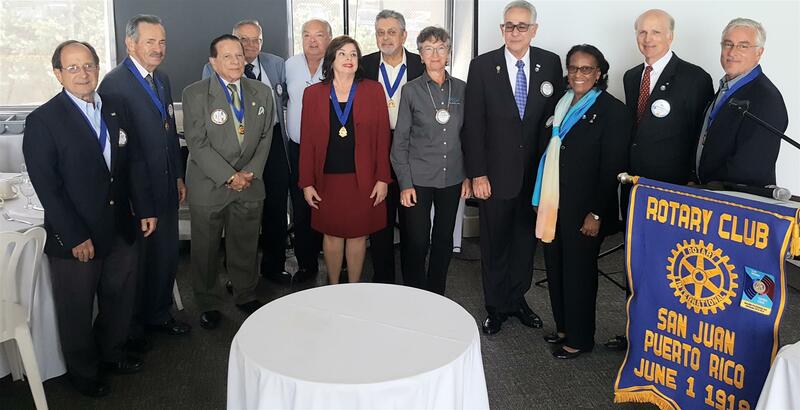 Inducted into San Juan Rotary on Tuesday was MICHELLE CRESPO DAVILA, President of Rolandia, Inc, located on Calle O'Neill in Hato Rey. 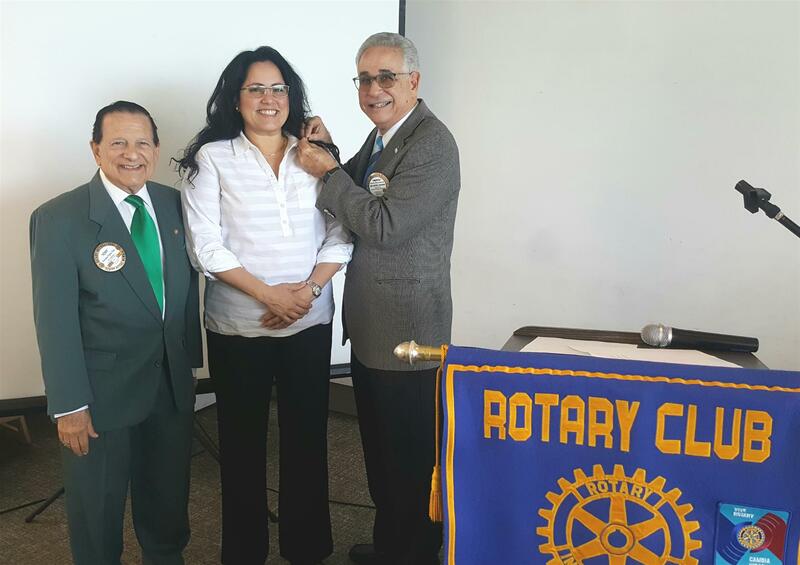 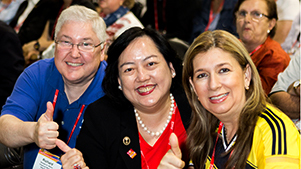 Michelle was sponsored by Past President Jorge Gonzalez. 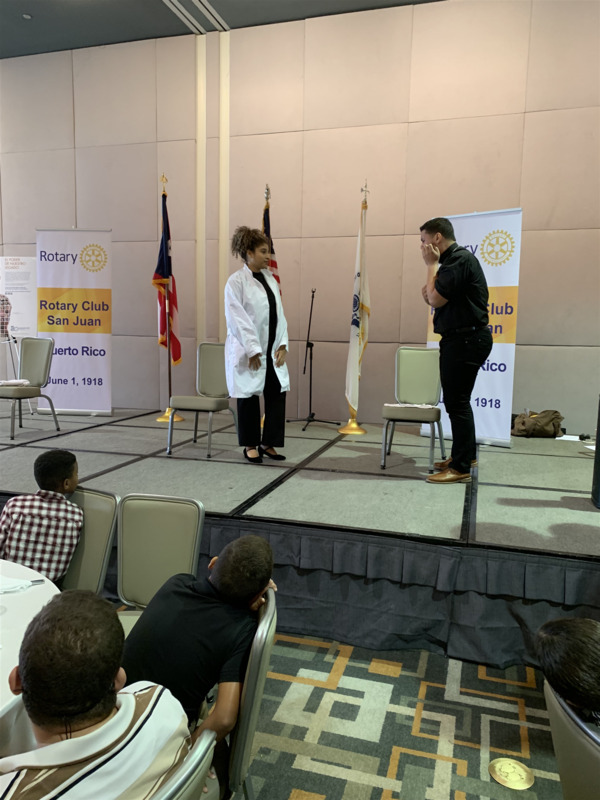 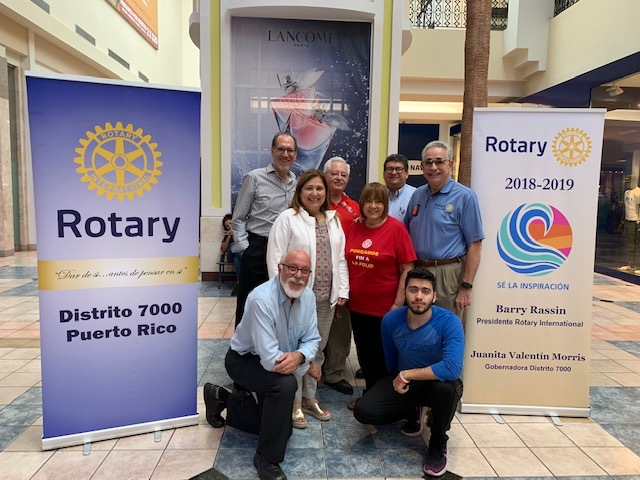 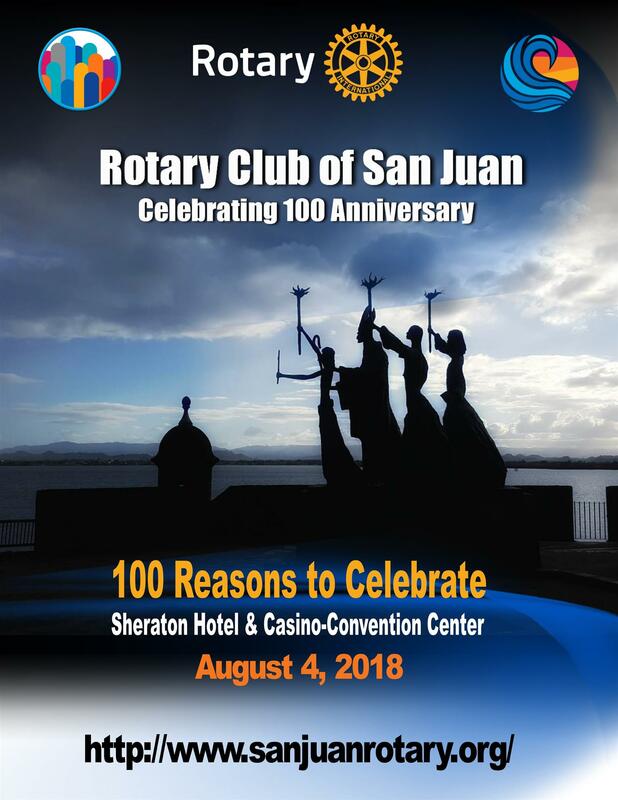 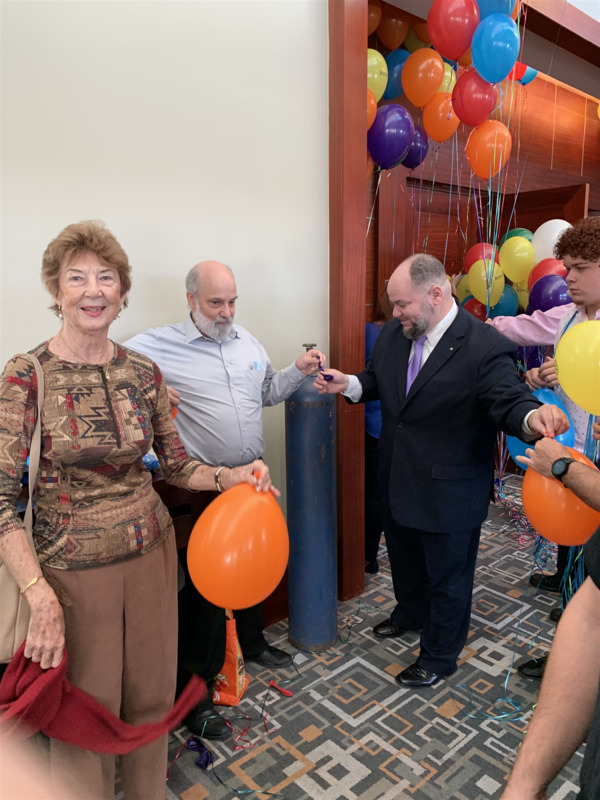 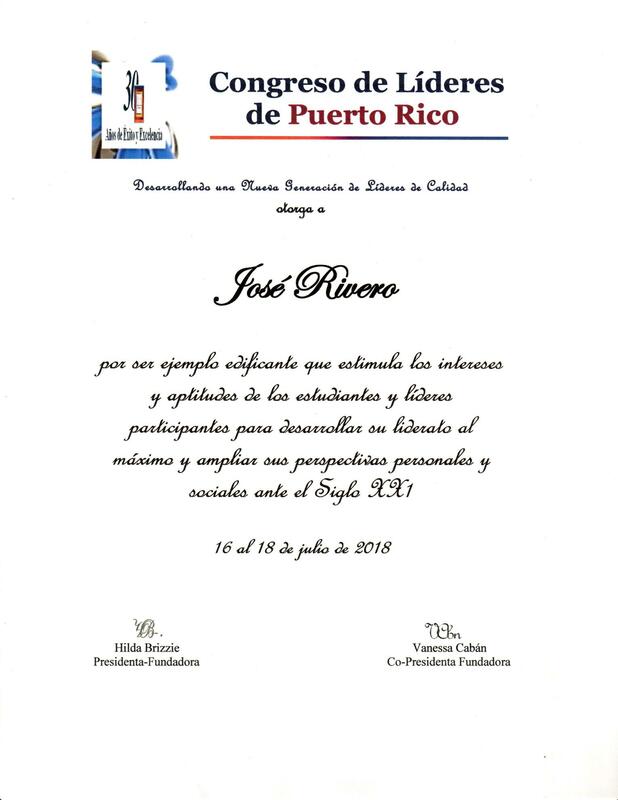 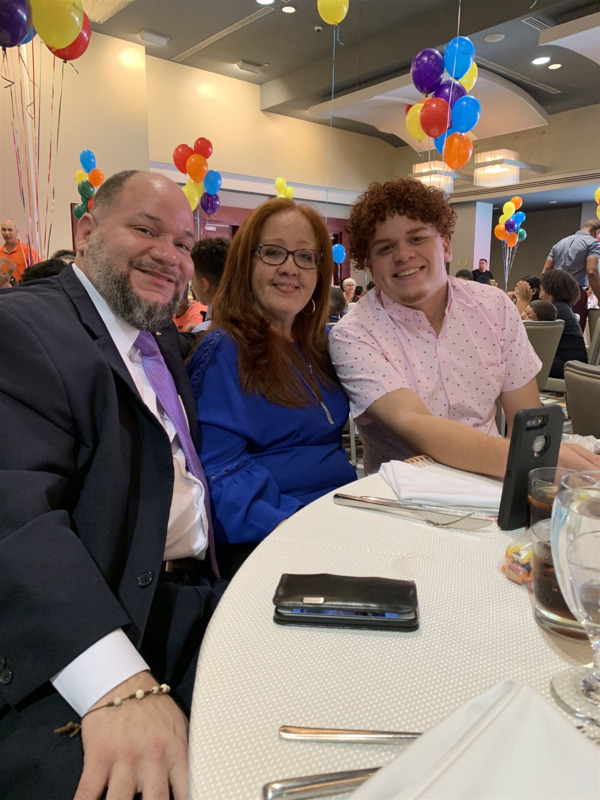 Starting on February 20, San Juan Rotary and the e-Club of PR and Las Americas will take their turn promoting the First Virtual Silent Auction in Plaza las Americas. 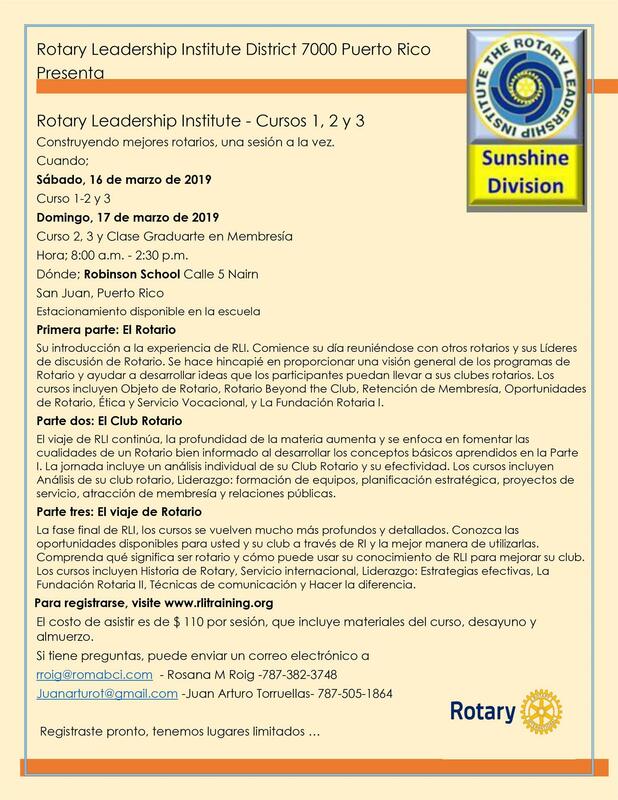 On webpage www.rotary-e.org, you can see what is being auctioned. 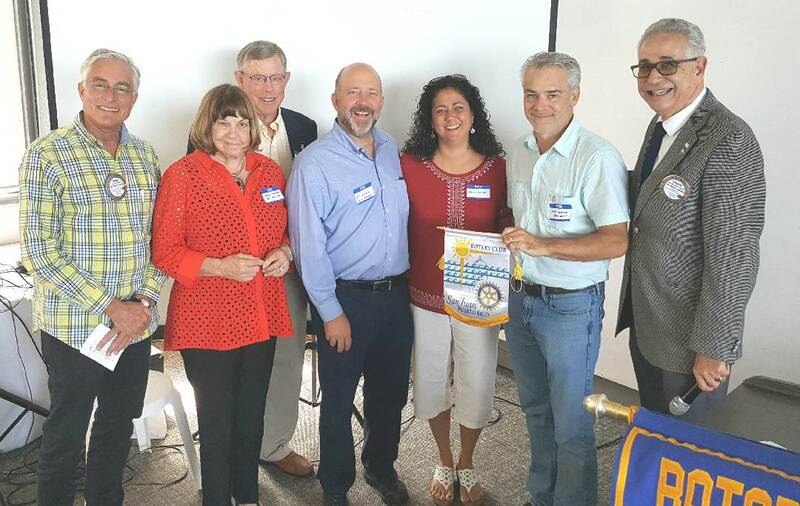 An example is a week's stay in San Diego, CA. 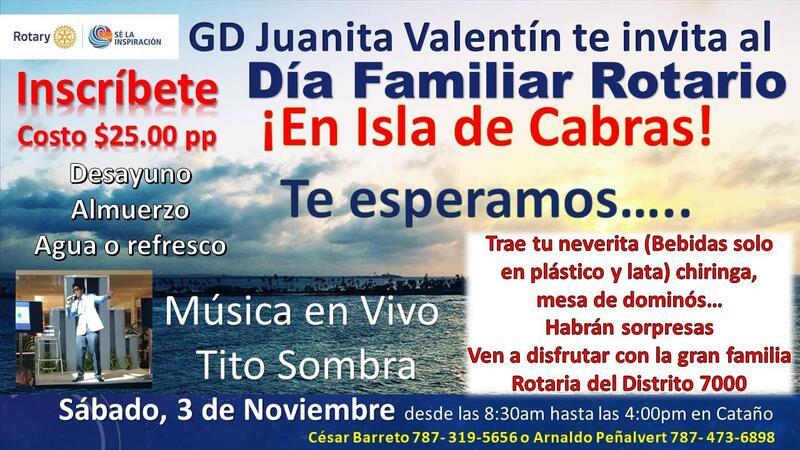 Fine jewelry and paintings by well-known artists, are also being offered. 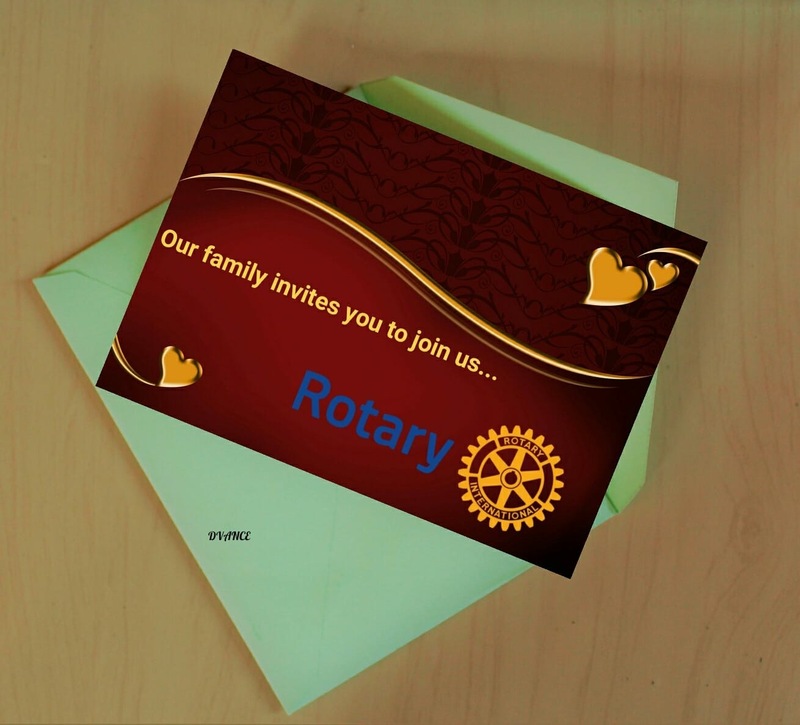 Go to the webpage and participate in the 8th Anniversary of Rotary's Virtual Silent Auction. 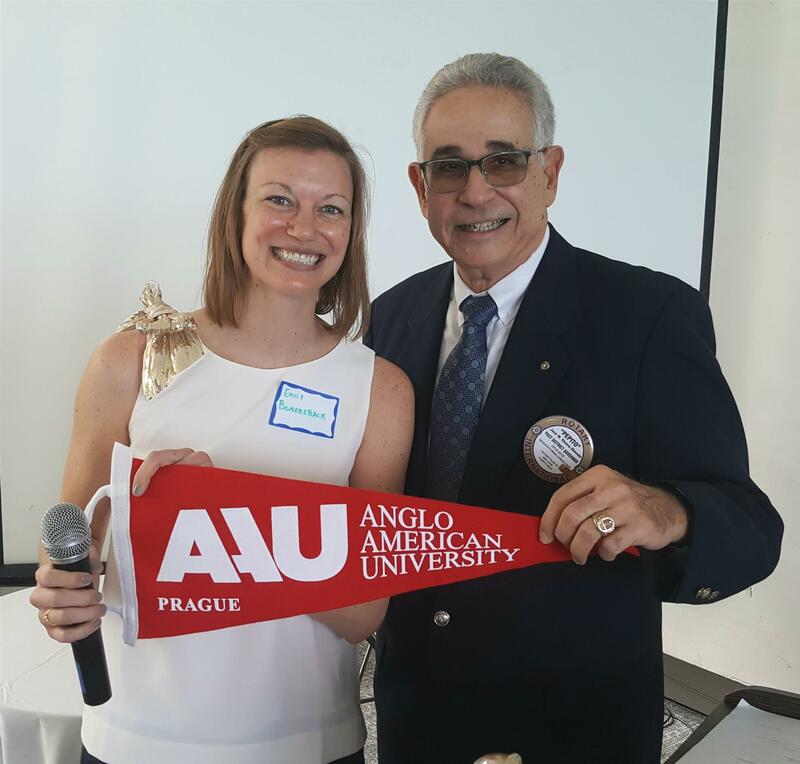 For enrollment in the Anglo-American University in Prague, the Czech Republic, was EMILY BOMERSBACK, Admissions Director. 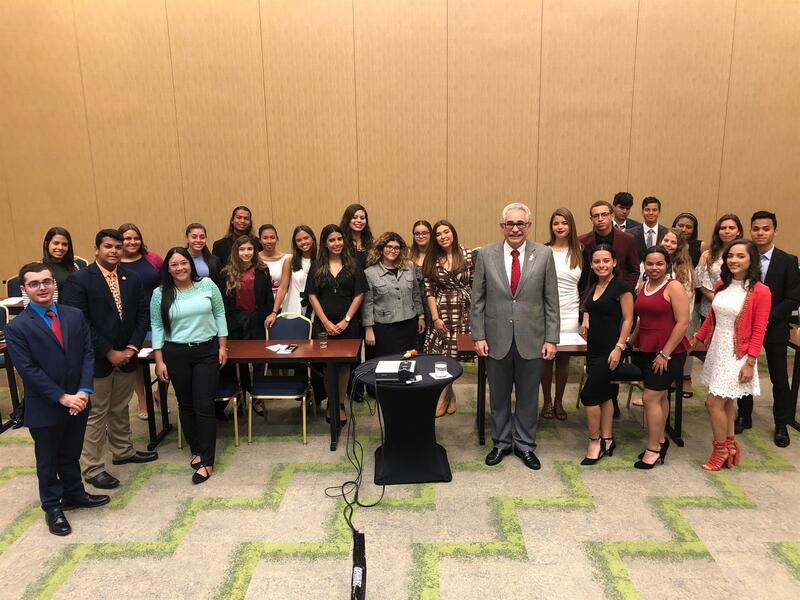 Offering 17 undergraduate and graduate programs entirely in English, all of which are accredited by the U.S. Department of Education, with students automatically considered for academic merit scholarships, Director Bomersback can be contacted at: Emily.bomersback@aauni.edu. 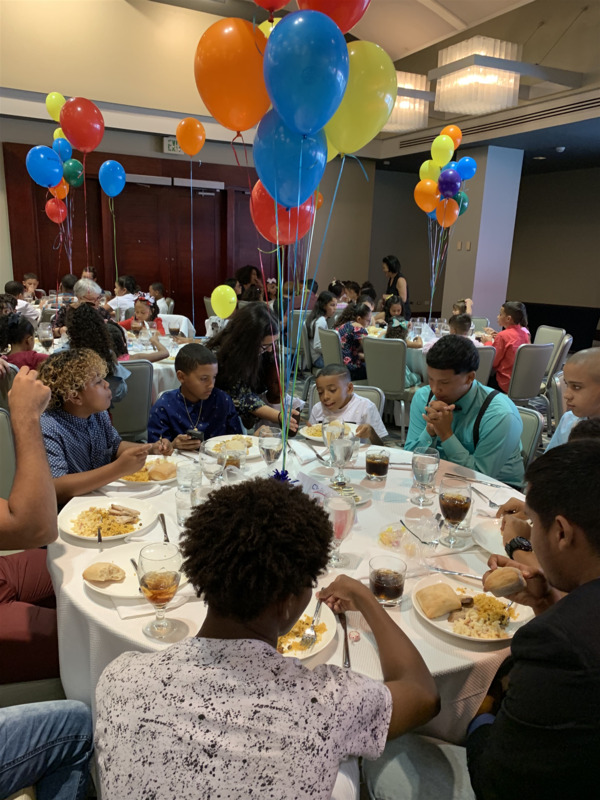 Three Cheers for Perfect Attendance! 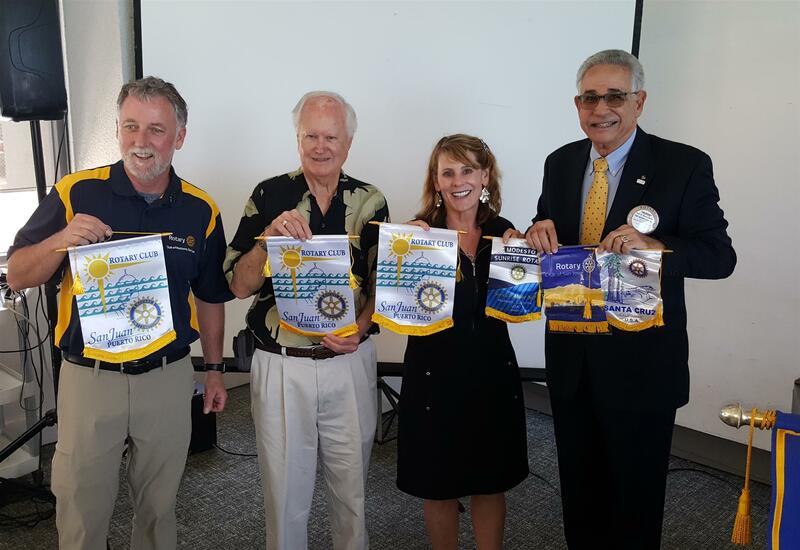 Achieving 100% Attendance in the October-December Quarter were: Ken McGrath, Maria Elena Perez, Luis Ramirez, Jose M.(Pepito) Rivero-Olmedo, Enrique Sigas & Juanita Valentin Morris. 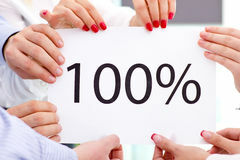 The Reserved 100% Table will be waiting for you as you enjoy a complimentary glass of wine. 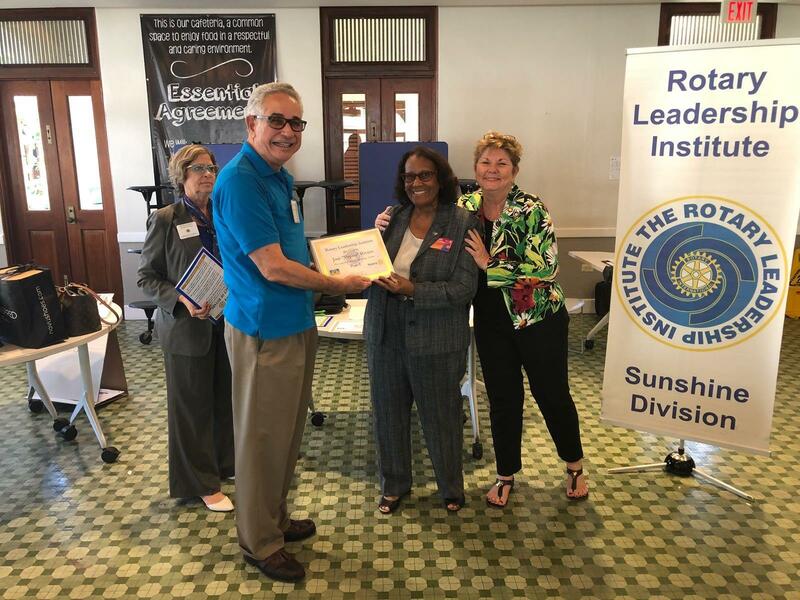 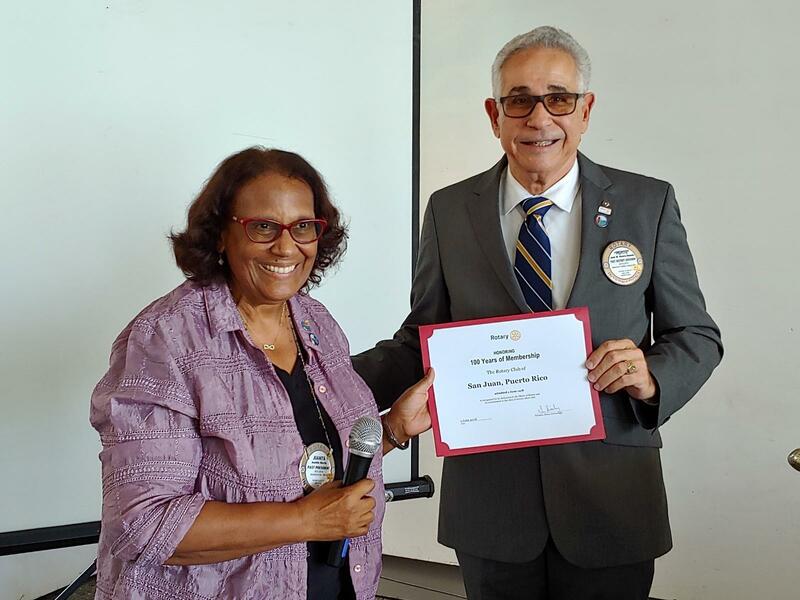 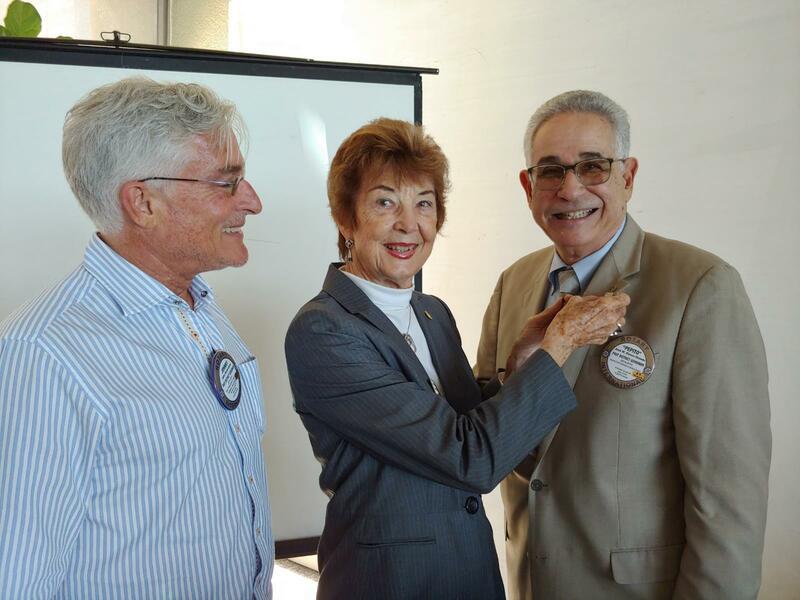 Rotarian & Director Carmen Hammel as she receives her 2nd Paul Harris Award from President Pepito and Rotary Foundation Chairman & Past President John Richardson. 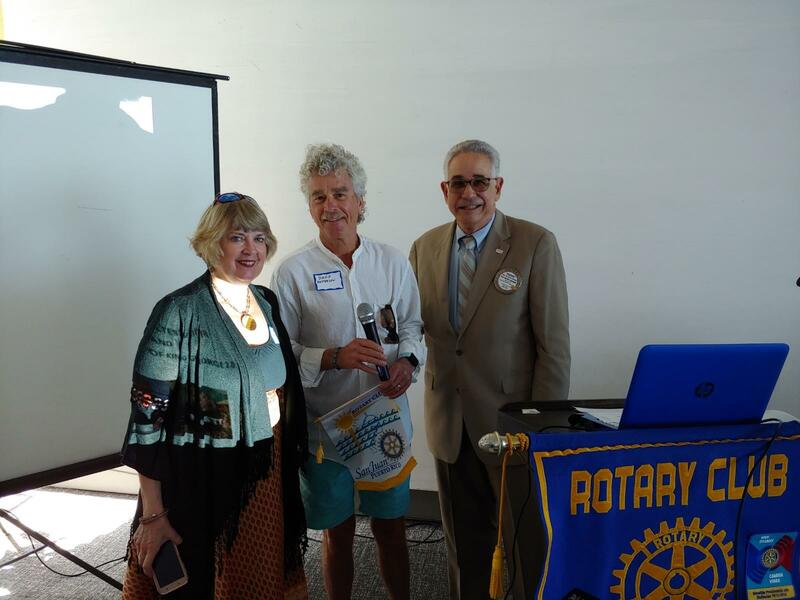 Former San Juan Rotarian and now a Rotarian in Franklin, Tennessee, DAVID HESS, presented a donation to the San Juan Community Library. 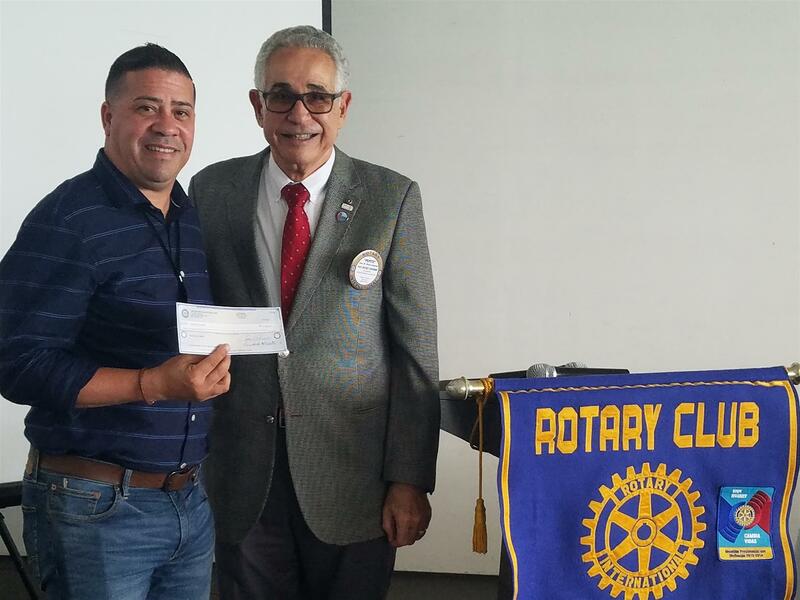 Receiving the check was Rotarian JOSEPH SAMPSON. 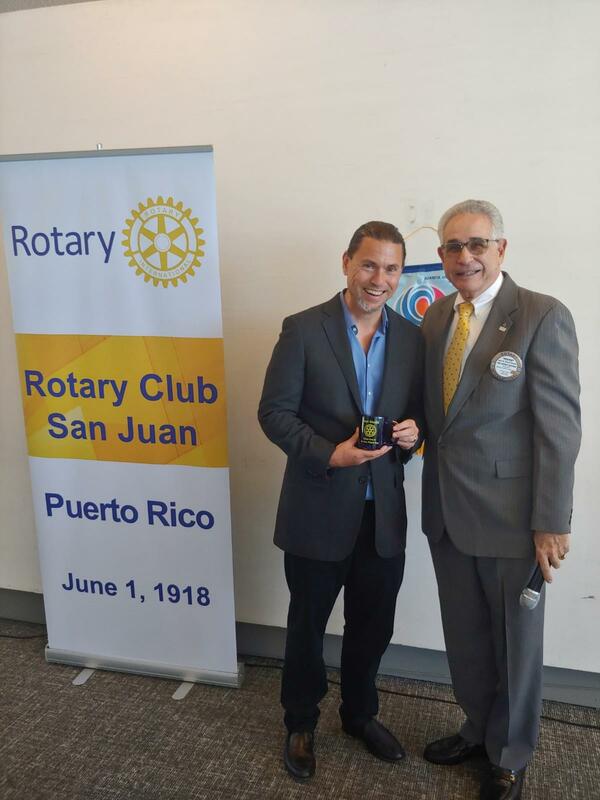 San Juan Rotary recognized the waiters, who faithfully serve us weekly, with a Christmas gift. 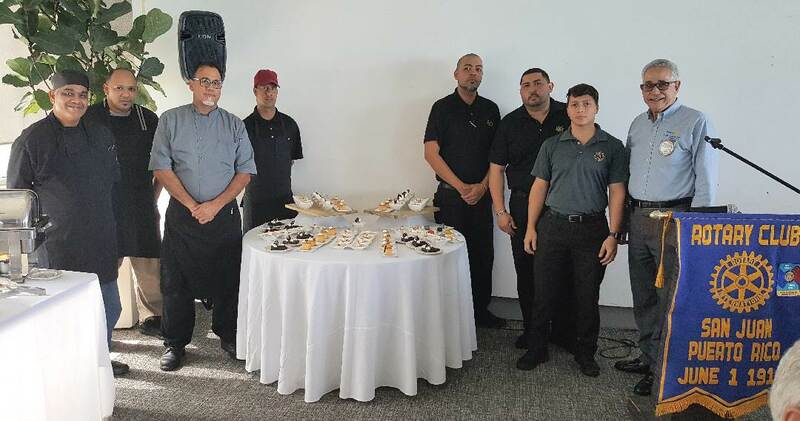 Also receiving congratulations for their culinary skills was the Chef and his kitchen staff. 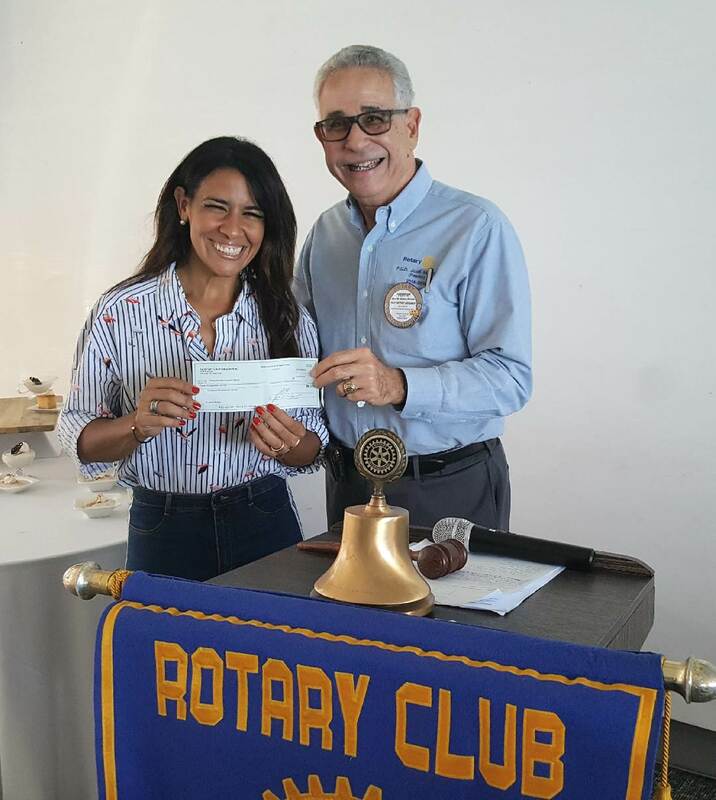 On behalf of our Hurricane Relief Committee, President JOSÉ M. (Pepito) RIVERO is shown handing a check to OMAYRA BORGES, VP of Fundacion Mochileando, an organization dedicated to repairing homes damaged in Hurricane Maria. 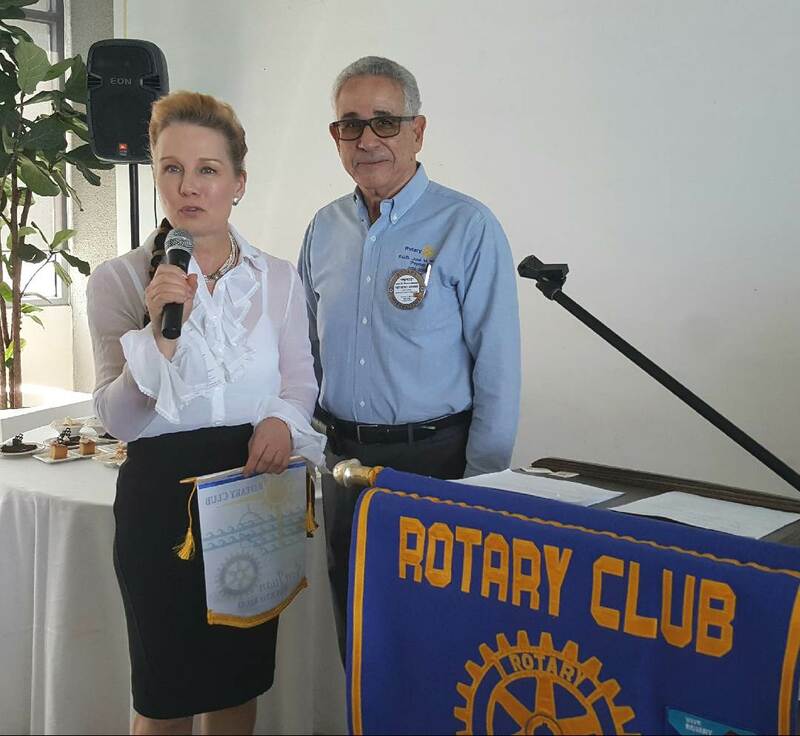 Visiting Rotarian, ANNEMIEKE DIRKES, from the Rotary Club of Doetinchem, The Netherlands, received our banner from President JOSE "PEPITO" RIVERO. 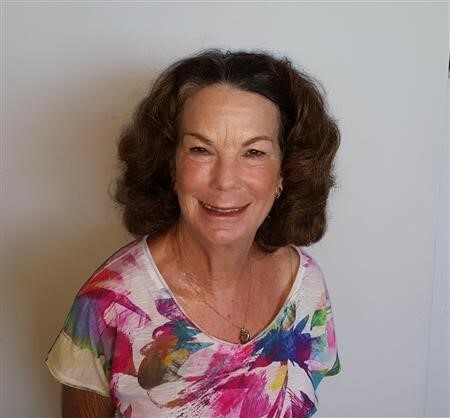 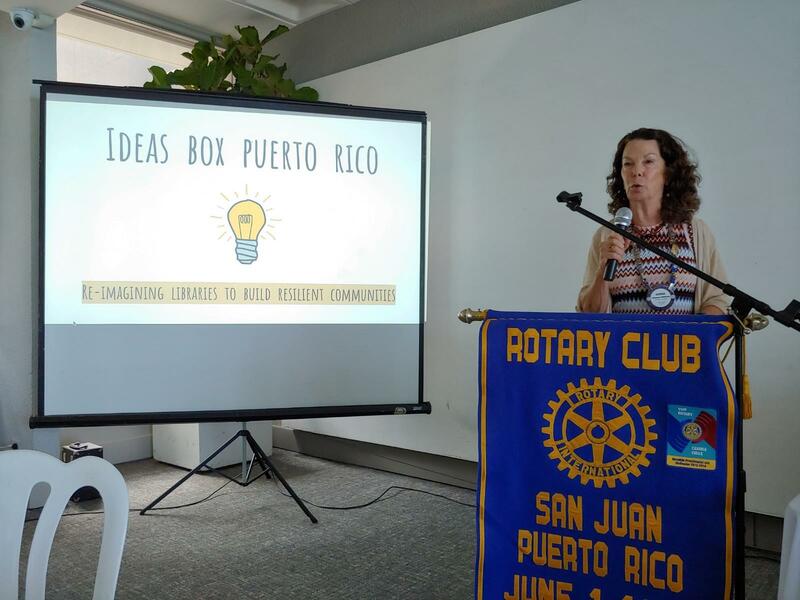 Rotarian ANNEMIEKE is the CEO of Blockchain Projects and is a member of her Club's International Committee. 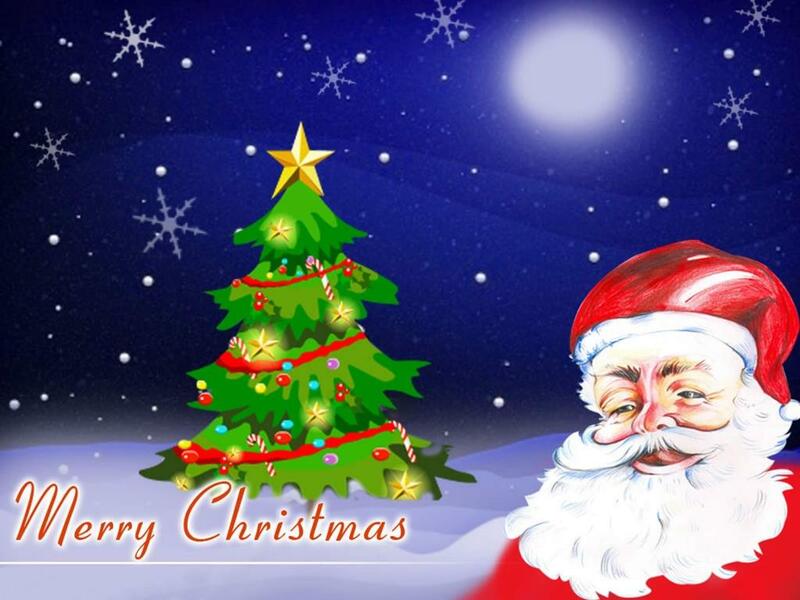 Be sure to mark your calendars and invite spouses and friends to our HOLIDAY LUNCHEON on TUESDAY, DECEMBER 18, in the AFDA Club. 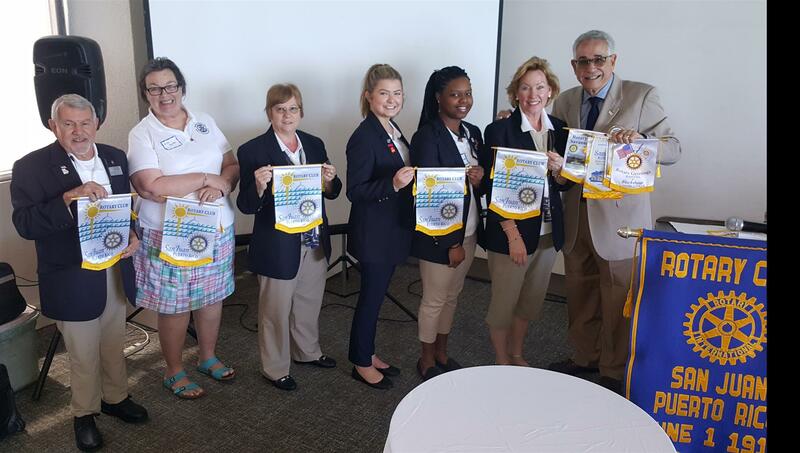 ROTARIANS FROM DISTRICT 6900's Rotary Club of Peach Tree City, Georgia, headed by President Mike Nelson, joined us for lunch last week. 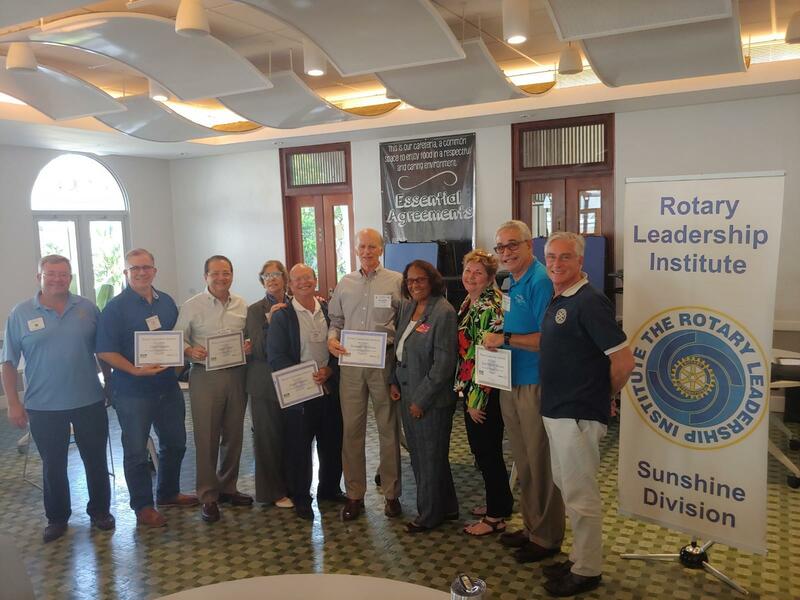 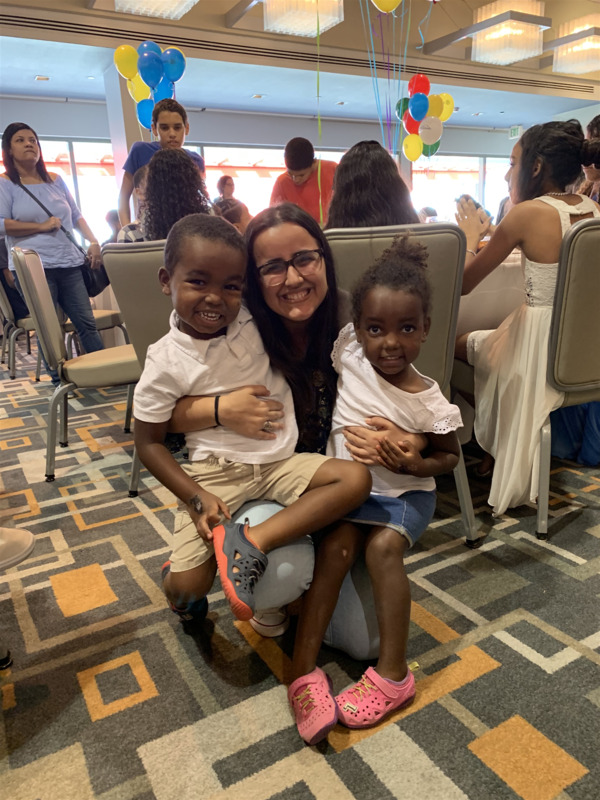 We thank them for the generous $54,000 contribution to the Souns Puerto Rico Program for children's early education. 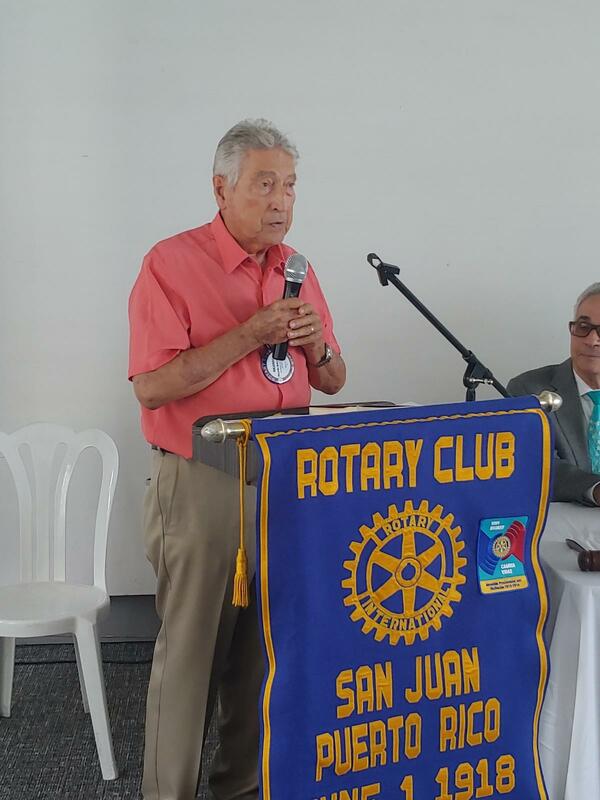 Inducted into San Juan Rotary was Dr. Julio M. Soto, (Medicine: Consultant). 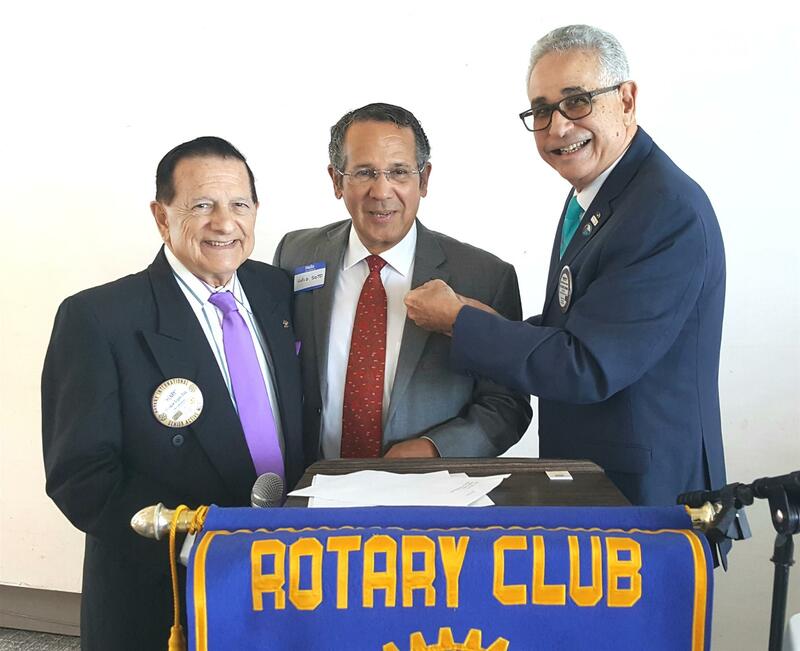 A former member of the Club, Julio was sponsored by Dr. Norman Maldonado. 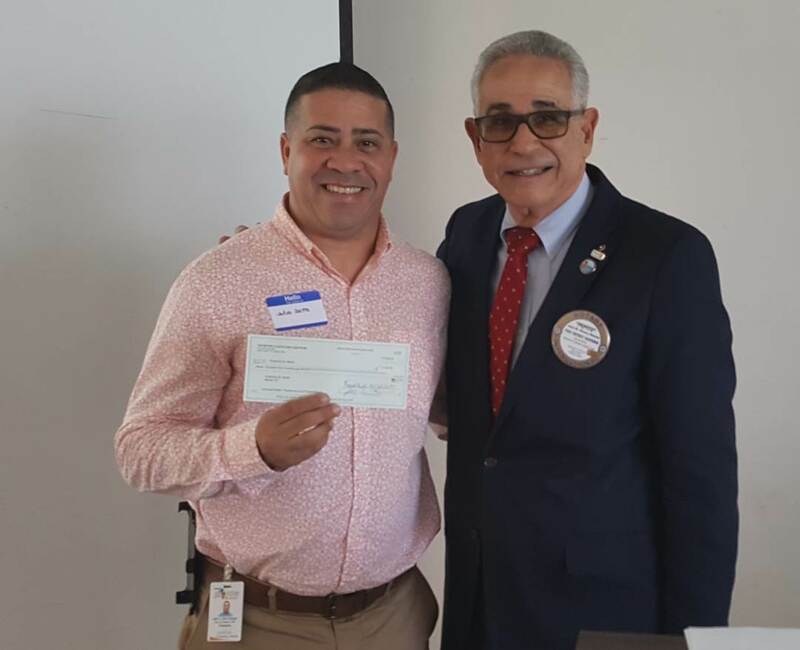 Also joining our Club is new Palmas Del Mar Satellite Member, Gregory Scott Boyd, sponsored by Membership Director, Enrique Sigas. 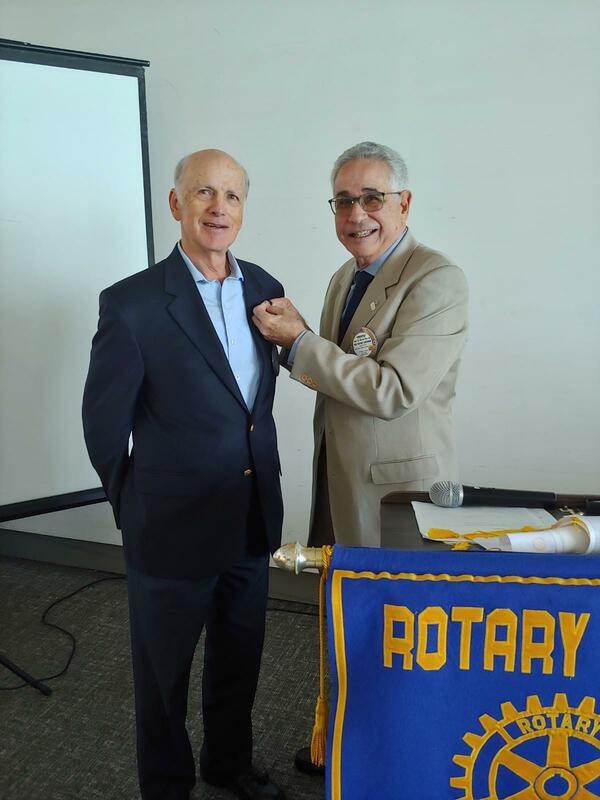 A warm welcome to Rotarian Greg. 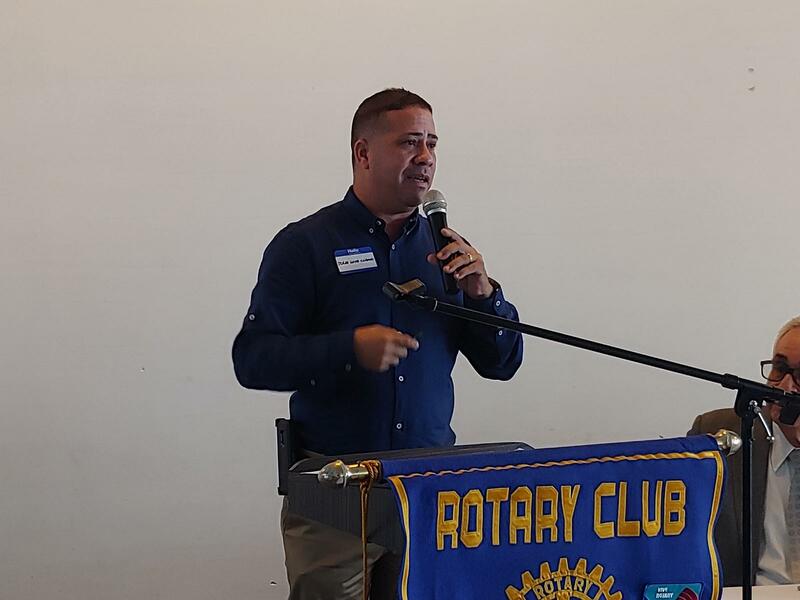 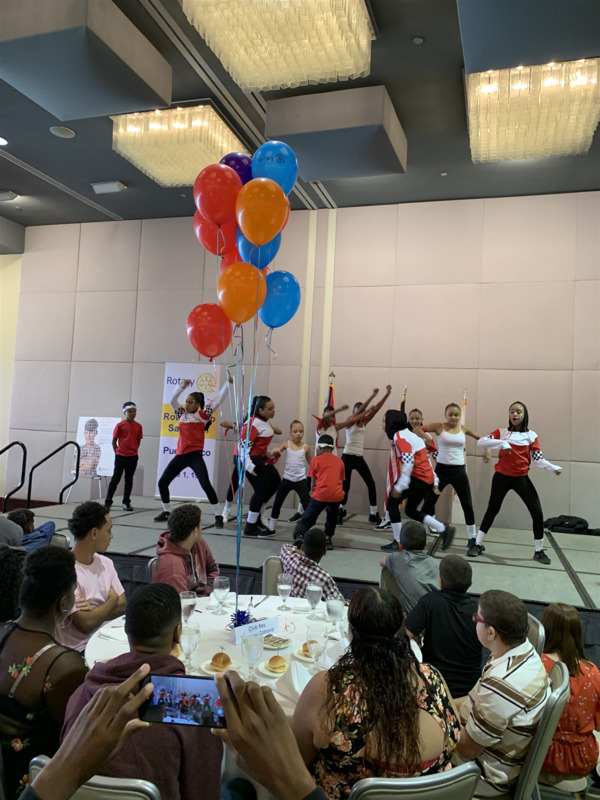 FOUNDER & PRESIDENT Julio Soto Cubano of Pisadas de Amor, an organization formed to help seniors in need, gave a video presentation highlighting various homes restored in San Juan, Manati, Caguas and Vega Baja. 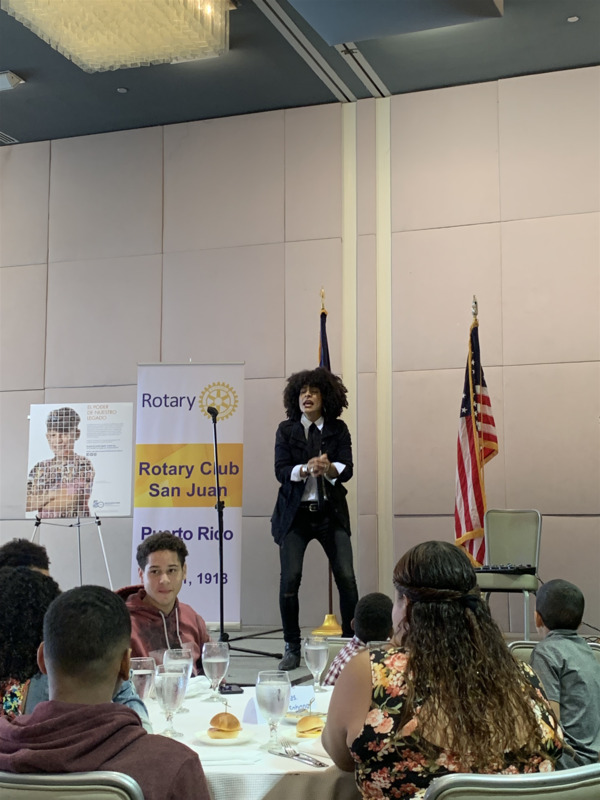 Replacing furniture, cabinets, stoves, refrigerators, clothes and other goods destroyed by Hurricane Maria, made the homes habitable again. 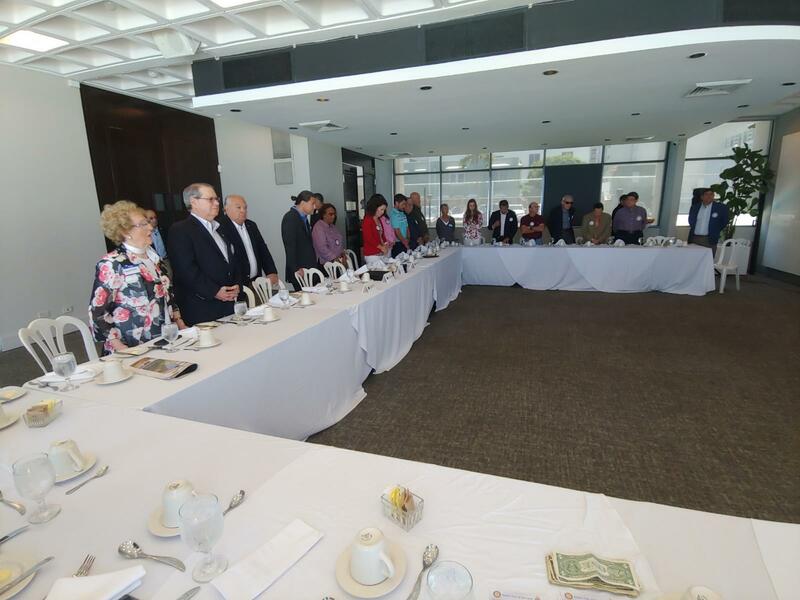 With” A Todas Por Mis Viejos", as the theme, the video clearly showed the dramatic changes In the lives of many affected oldsters. 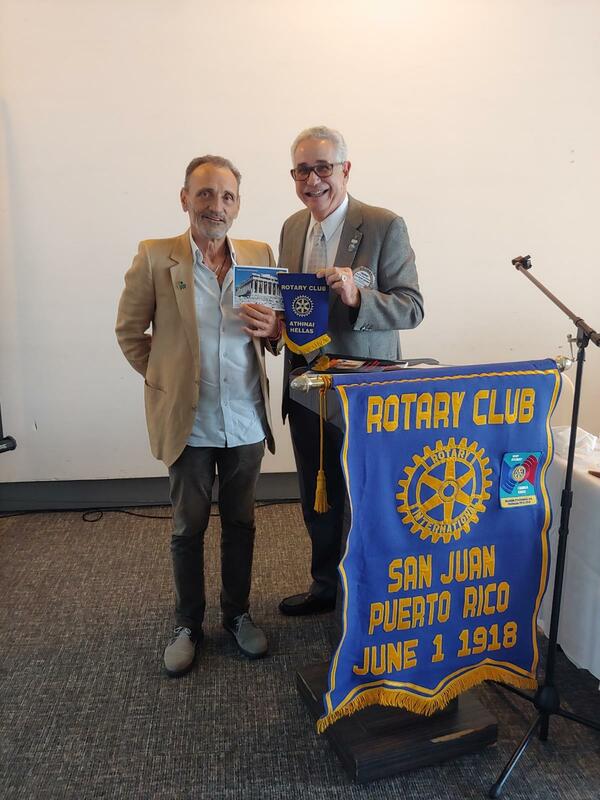 ROTARIAN JOSE ISMAEL IRIZARRY presented President Pepito with a banner from the Rotary Club of Athinai (Athens) Greece together with a stunning make-up card featuring the Parthenon Temple on the Acropolis The Athens Club is celebrating its 90th year. 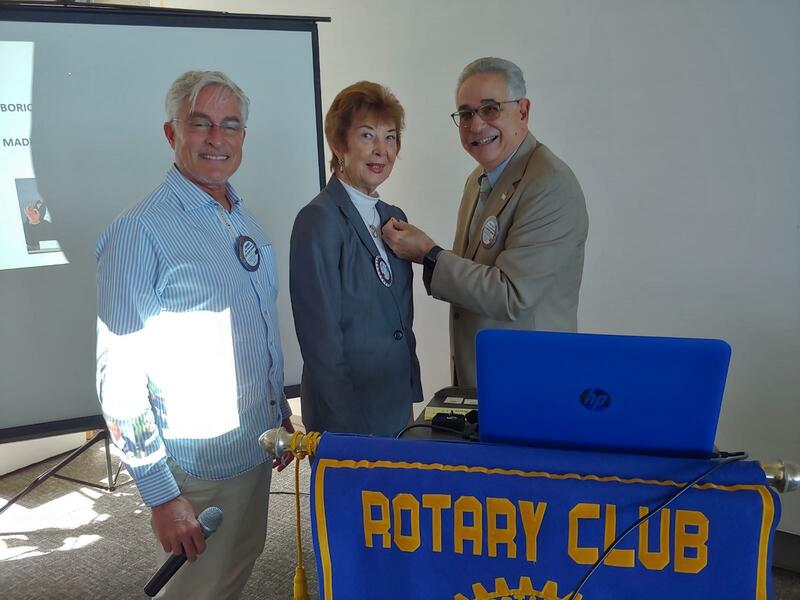 Jose was happy to share our 100th Anniversary pin with Dimitrios Mexis, Secretary of the Athens Club. 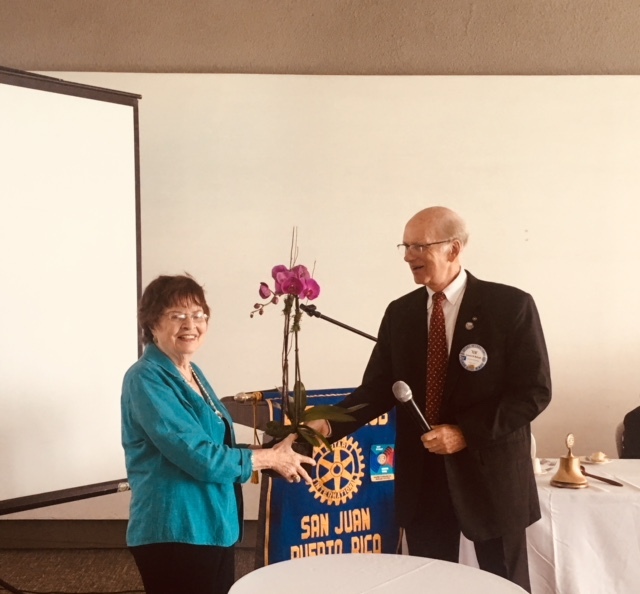 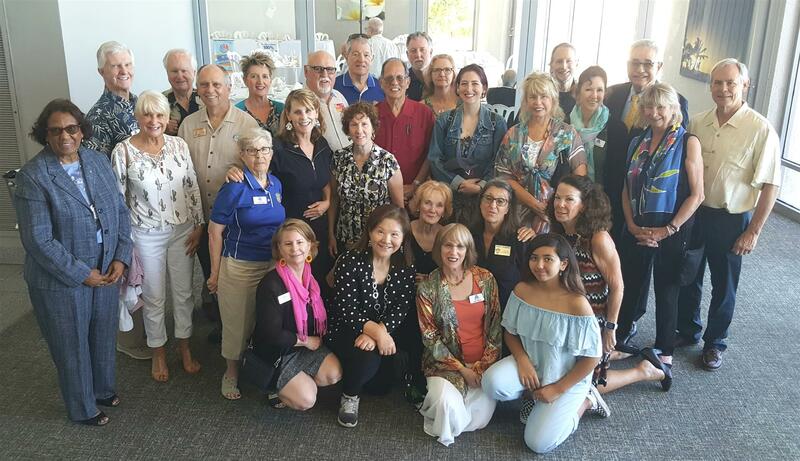 CLUB DIRECTOR GEORGANNA HILDEBRAND brought us up-to-date on several of the Global Grants funded by Rotary International including the Global Grant for Teatro Por Amor in Peace and Conflict Resolution. 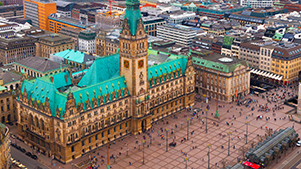 This Grant covers all four housing areas that have recruited students studying conflict issues like drug use and gangs. 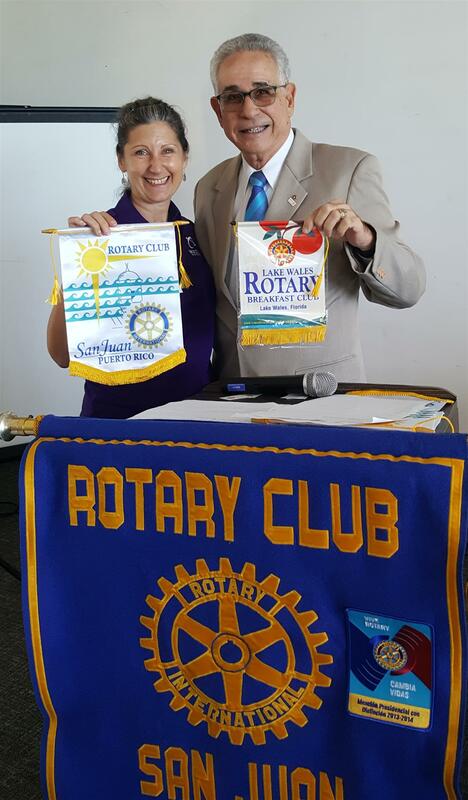 Another large project for a Global Grant is the economic recovery in Punta Santiago (together with P.E.C.E.S. 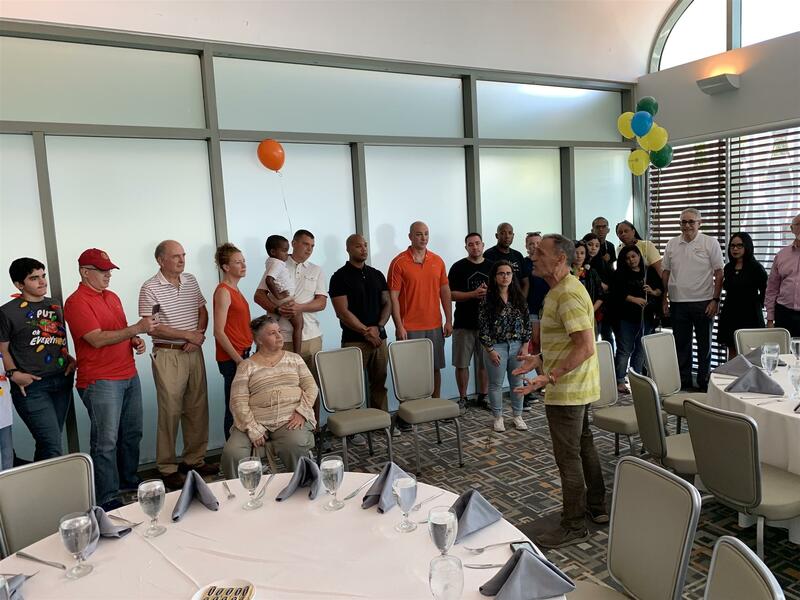 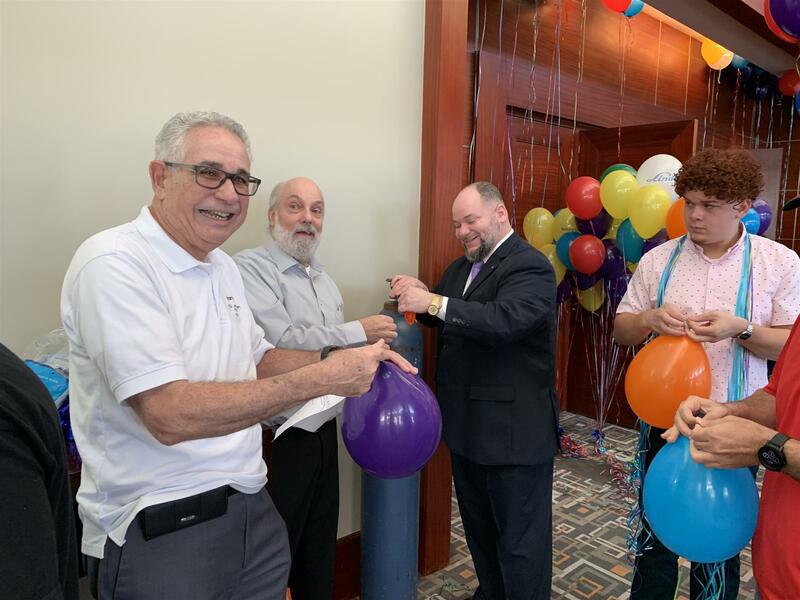 ), a project that will provide equipment and training to ten businesses that were damaged by Hurricane Maria and will train 50 underserved residents in carpentry. 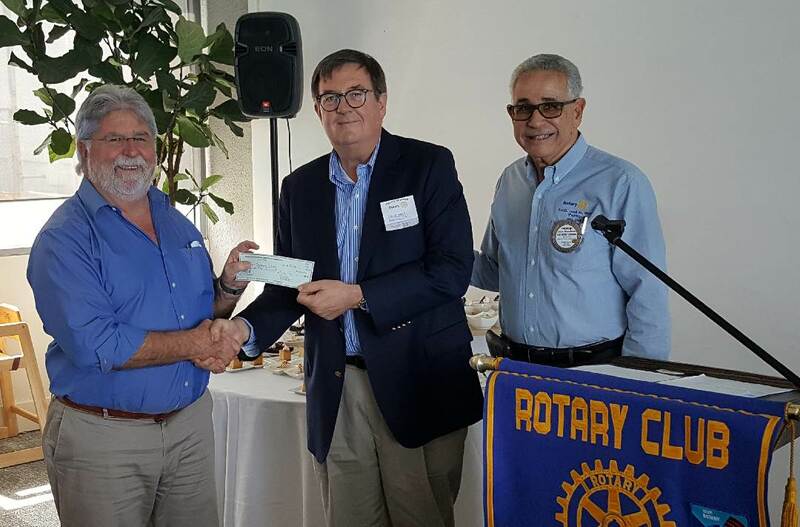 As reported previously, Rotary clubs in the States have been most generous in sending monies and relief efforts continues as we find worthy projects. 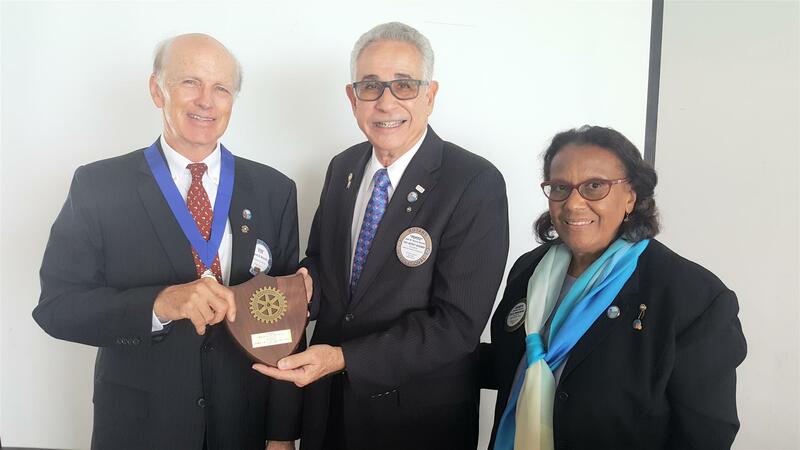 IMMEDIATE PAST PRESIDENT KENNETH McGRATH received his 3rd Paul Harris Award this Tuesday. 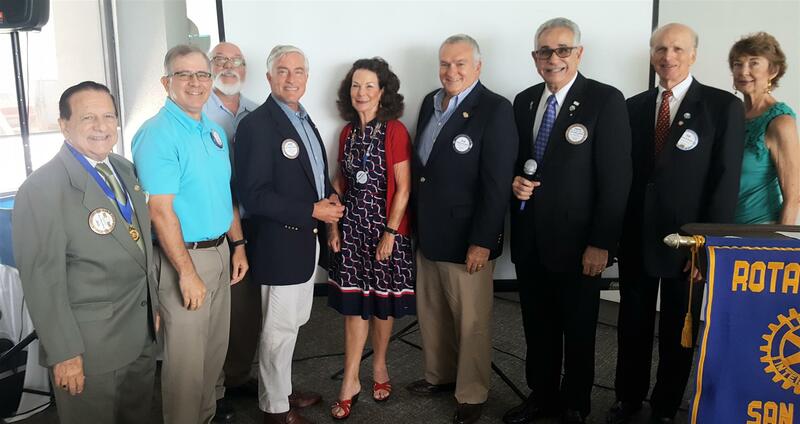 OUR CLUB'S PAST PRESIDENTS, from 1967-68 TO 2016-17, attended in full force to the Change of Command program. 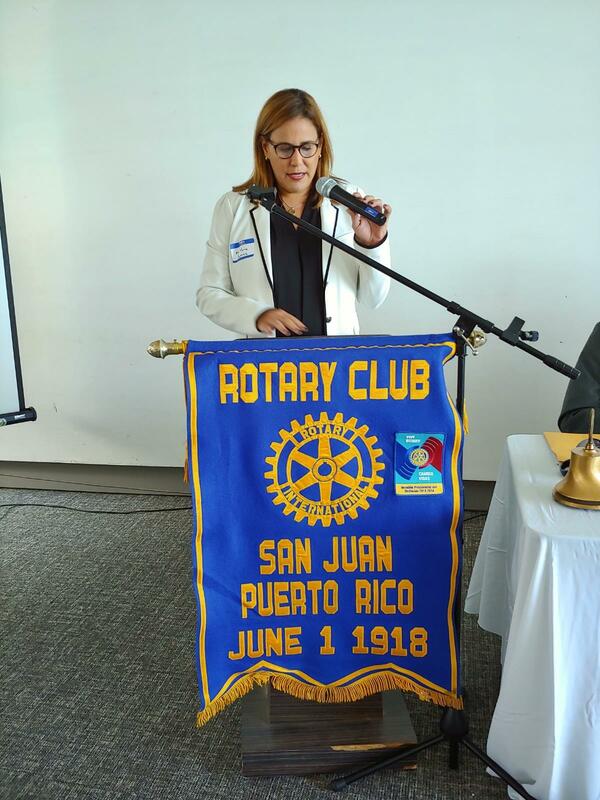 "Economic Prospects After Hurricane Maria."